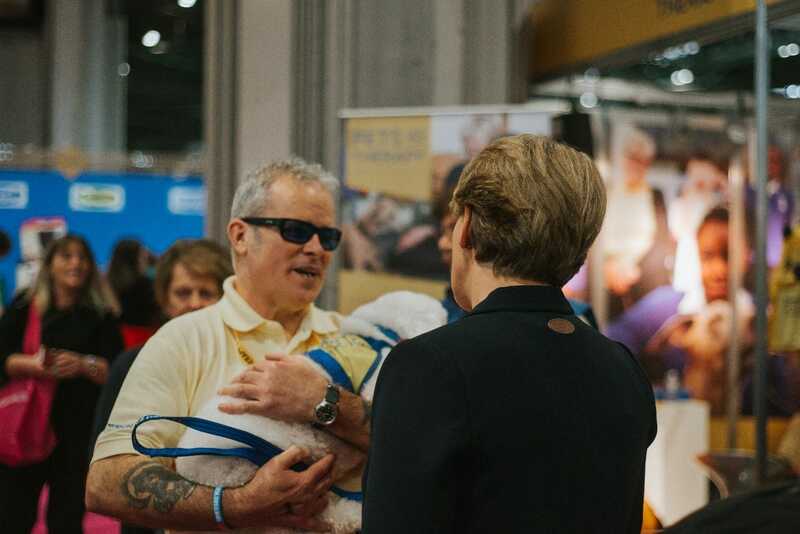 For many years, Pets As Therapy have exhibited at Crufts, the famous canine event that takes place in March. It’s an opportunity for their staff and volunteers to raise awareness of the charity and to chat to prospective volunteers. Every year the charity runs a competition to recognise outstanding Pets As Therapy volunteers, and crown one PAT dog as the Dog of the Year. This year the competition was sponsored by HiLife Pet Foods, and the prizes were kindly donated by them. They whittled down the nominations to six finalists, who were then featured in Yours Magazine for readers to vote for a winner. Bella the Bichon Frise and owner Barry Coase were the proud winners of this prestigious award. They visit numerous establishments as Pets As Therapy volunteers, including Combat Stress in Leatherhead where they work with military veterans who suffer from PTSD. They also visit a Critical Care Unit at Eastbourne District General Hospital, where they help to improve the moods of staff as well as patients. 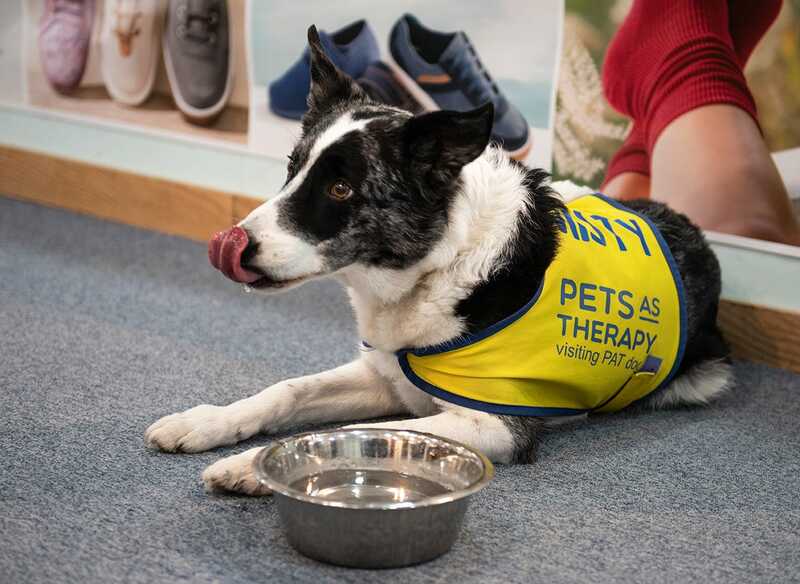 Pets As Therapy also hold a PAT show dog of the year competition at Crufts. It can be entered by any of their Pets As Therapy registered visiting volunteers or charity supporters. Stakes class events take place at 5 dog shows across England, Wales and the Channel Islands throughout the year preceding Crufts and produce a total of 14 finalists. 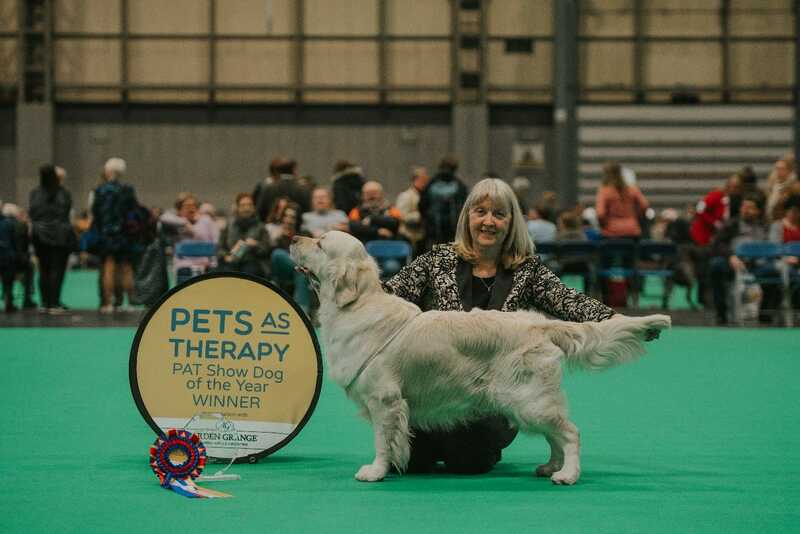 The final of the PAT Show Dog of the Year took place on Saturday 9 March, and the winner was Sue Riley and her golden retriever Carson (also known as ‘Fluffy Bear’), from South Wales. If you are interested in becoming a Pets As Therapy volunteer, visit www.petsastherapy.org. 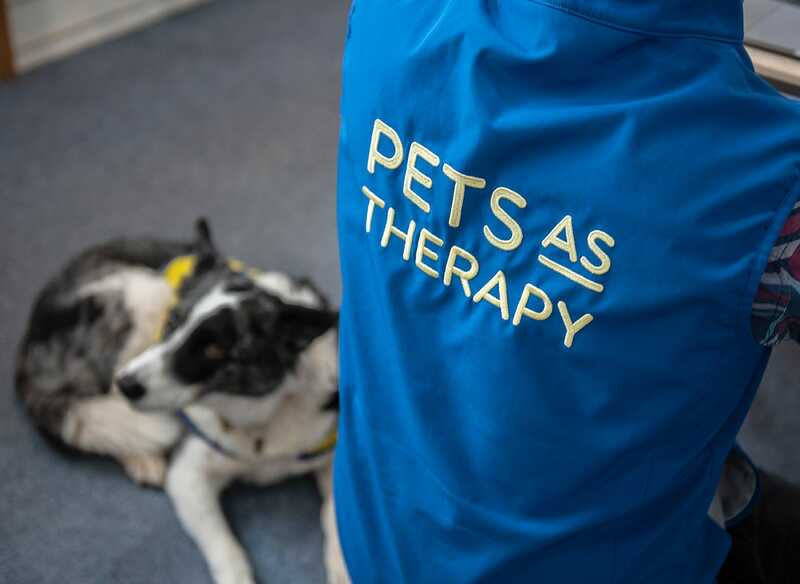 Pets As Therapy have been our chosen ‘Charity of the Year’ since March 2018. Pets As Therapy otherwise known as PAT are a national charity that was founded in the UK in 1983. Their aim is to enhance health and wellbeing in schools, hospices, care homes, hospitals and more through the visits of trusted volunteers with their behaviourally assessed animals. PAT has over 6,000 volunteers and is very supportive to those who take part. All pets, though most commonly dogs and cats are initially assessed before doing valuable work for those in need. Specifically dogs need to be calm, collected and not bark or jump too much so as not to alarm or scare anyone they help. 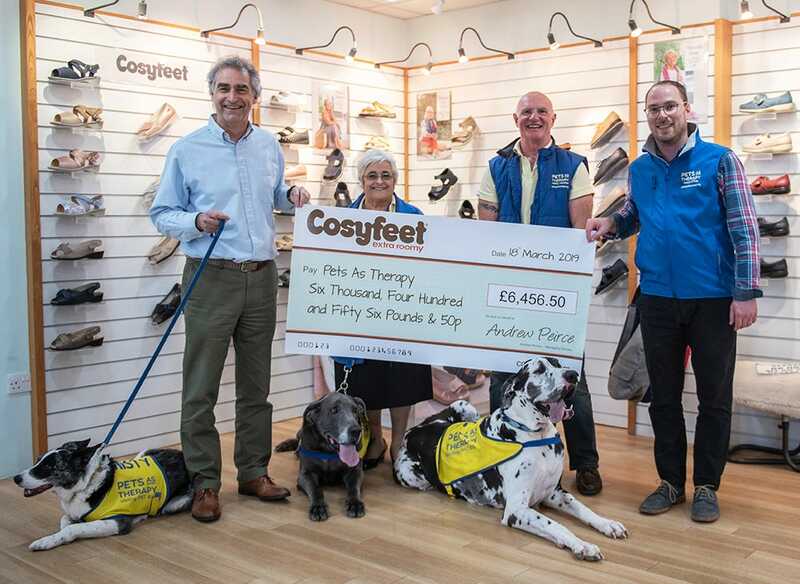 Being animal lovers here at Cosyfeet, Pets As Therapy were an easy choice for our ‘Charity of the Year’ and the fact they’re doing such lovely things for the community as well as the organisers and volunteers being a delight to communicate with. Here at Cosyfeet, we raise money for Pets As Therapy by donating 25p from the sale of every pair of Holly and Richie slippers sold. As a business we are firm believers in giving back to the community. In the last year we have raised £6,456.50 for Pets As Therapy and to celebrate we got a big cheque printed and our Managing Director, Andrew Peirce handed it over to Pets As Therapy Organiser, Matt Robinson who accepted the cheque on behalf of the charity, while surrounded by the delighted volunteers and their pets. “These dogs really are an ice breaker for those they help, including dementia sufferers and children with learning disabilities”, says Pets As Therapy Organiser, Matt Robinson. “We’re so lucky to have such wonderful canine and human volunteers. We also have cats." Humans, left to right: Andrew Peirce, Diana Barnes, Spike Audus and Matthew Robinson. Dogs, left to right: Misty, Leyan and Sam. At our PAT visits Cosyfeet event we met the lovely Diana from Bristol who came with her two big but adorable Great Danes; Leyan and Sam, who are lucky enough to live off a Waitrose diet! Diana, who lives and breathes this charity said "seeing that smile on someone’s face when they see the dogs is why we do Pets As Therapy." 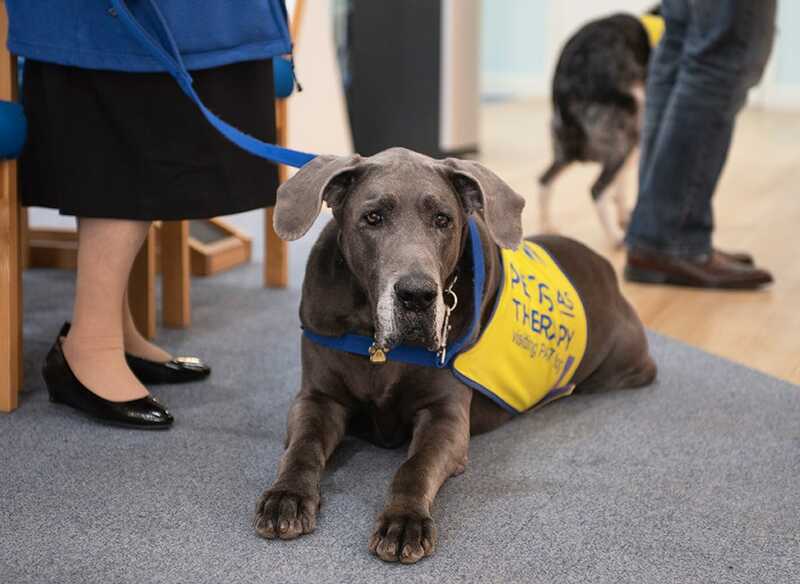 The gorgeous, calm and collected Blue Great Dane, Leyan who is 11½ is a former PAT Crufts runner-up and is especially skilled at working with autistic children. The Read2Dogs initiative has been introduced in a number of schools to help children overcome feelings of nervousness and self-consciousness when reading aloud. The presence of a therapy dog, as well as their teacher, makes them relax and feel more self-confident, enabling them to develop their reading skills more easily. Spike from Keynsham, attended our event with his charming 13 year old, Blue Merle Border Collie called Misty who has been successfully working with PAT for the last 4 years in the Bath/North East Somerset area. 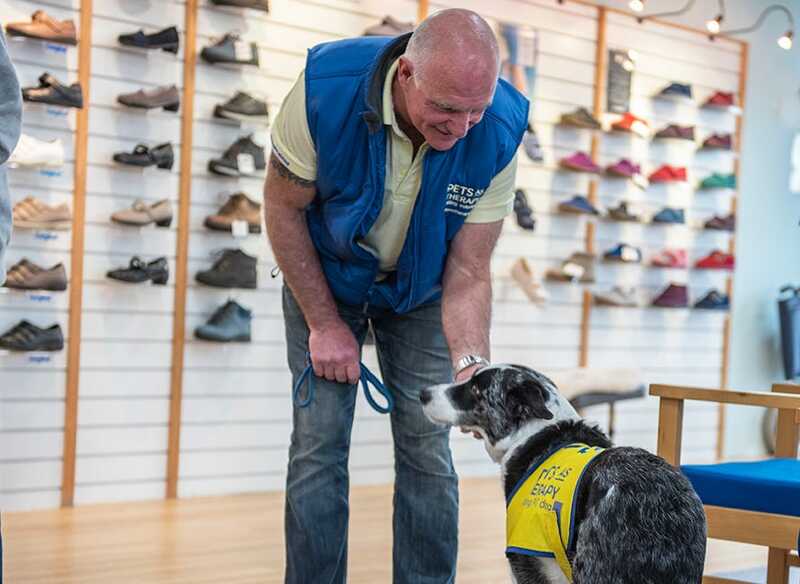 Misty's proud owner, Spike is very passionate about working for this charity and is delighted that "stroking a dog can simply help someone feel better and more at ease." He added "Misty loves to feel useful, and she’s very friendly and calm. During school holidays, Misty has visited clubs for kids with disabilities and autism, they love to walk her and play hide and seek." It was a lovely afternoon spent snacking on tea and cake, hearing stories of how these wonderful dogs have helped those in need... and giving them a much deserved snuggle! Thanks to Pets As Therapy organiser Matt Robinson and volunteers Diana and Spike with their beautiful therapy dogs for attending our event. Click here to find out more about Pets As Therapy.